Max Gallagher signs up for his first fishing competition. Did he enjoy it? I thought that might get your attention. Well, sorry, but this article is about my first foray into the world of competitive fishing. No prizes here unfortunately. I suppose I should start by talking about me as a competitor generally. In my youth, I was supremely competitive; with my brother, with my friends, with my team mates, against the opposition. I think we probably all are to a certain extent. This competitiveness, mixed with a serious enthusiasm for most sports, was channelled through the huge amount of rugby I played to a reasonable standard. I was competitive too on the river bank, wanting to catch the biggest fish, the most fish or the trickiest fish, albeit trying not to be too smug about it when I succeeded. Similarly, I would be pleased for my friends when they out-fished me, although there was probably a small part of me smoldering away inside. Yet, as I have got older, those competitive instincts have diminished, and now I am genuinely happy to see friends catching fish. You realise that it is time spent on the bank with your friends that is the important thing. For a competitive person, I'd never even considered competition fishing, probably due to my lack of ability, or a fear of humiliation perhaps. Plus in the back of my mind there seemed a certain element of luck to it. I once watched a coarse fishing match on TV and it very much felt like the winner was picked out of a hat when they drew their pegs. They all wanted Peg X, and the person who got Peg X duly went on to win the competition. I certainly didn’t know anything about fly fishing competitions. So, when the "Broadlands Classic" popped up on my Facebook feed mid-2016, I casually skipped past it. The thought of entering it didn't even register. 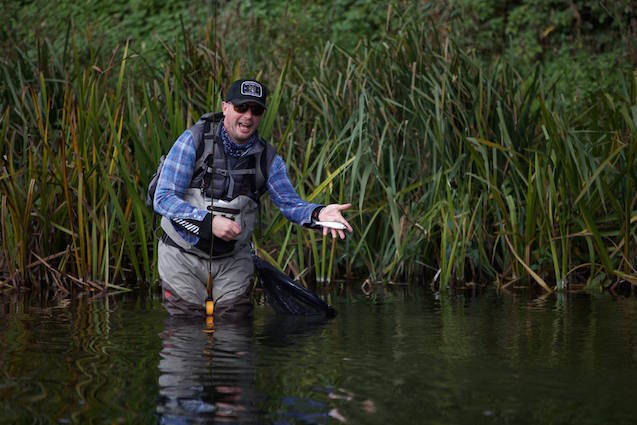 A few weeks later, Jon Hall, the head keeper at Broadlands, dropped me a line and asked if I wanted to enter. I think my reaction was something like: "Ha, you've got to be joking. I am nowhere near good enough to enter this!". 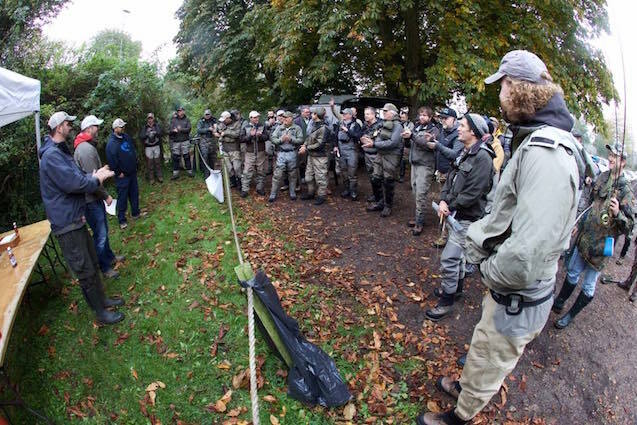 But Jon said it was a friendly event, a good opportunity to meet fellow fishermen and maybe learn from some of the best in the country. So, I entered. Sure, it'll be a laugh, I thought. I know a couple of the guys fishing. Plus it is great to have a day out on the river, especially the Test, whatever the scenario. Leading up to the event, I thought I had better go have a cast, hone the skills. Grayling fishing techniques were, and still are, very new to me; Czech and French nymphing, or what the Americans term Euronymphing. I had pretty much done all my fishing with a 9ft #5 rod and a floating line. But I had some success the weekend before. Fishing the Wiltshire Avon, I had a belting day, catching 30 or 40 odd fish (I lost count after 10 or so). Suddenly, that competitive instinct started kicking in. One week before competition time and I start thinking: "Hello! Mybe I've got a chance...". The butterflies started kicking in. I could almost see the headlines: Rookie angler casts himself to victory in the Grayling Classic. Well, I didn't win...I came second...second last... and this is how the day unfolded. Arriving at Broadlands a full 10 minutes before starter’s orders, and with the tail end of norovirus kicking about, it was a mad scramble. With a mouthful of bacon butty, I quickly drew my peg and got to setting up my rod, chucking on three suitable looking flies. Where is peg 14? A good schlep upstream is where, and the best way to get up there was in the car, so I quickly split the rod back in two and chucked it in the boot. T-off was now imminent, so I legged it up to the top of the beat as quickly as I could. Grabbing a sorry tangled mess of flies, nylon and carbon fibre from the car, I continued the last hundred yards of the journey on foot. My gear was a right mess. No good trying to unpick that, better off to just start again. It is amazing how, when the time pressure is on, those knots you usually find quite simple become very fiddly. I got there is the end, but fishing was well underway by now and my 90-minute session was going to be more like 60. Still, “Get those flies in the water Max, plenty of time for you to achieve a glorious victory”. So I had to get fishing. No time to recce the water in any detail, I just had to get myself in there. I spotted a couple of small grayling, got into position and made my first cast...straight into the tree behind me. Brilliant. Lost the lot! My controller (who in my mind's eye should by this stage have been busy keeping tally of my burgeoning catch) very sportingly offered me his rod and to re-rig mine, but given how the day was going, a broken rod tip didn't seem beyond the realms of possibility. I re-rigged myself. 45 minutes. It is probably here that I should mention the wading. On my one previous trip to Broadlands, wading was not permitted in order to protect the salmon and trout redds, so I had assumed once again that there would be no wading. I had brought an old pair with me for scrambling about the banks on a damp October day, but they were full of holes. Big holes. So, seeing a fellow competitor downstream of me, up to his naval in the river, I realised I was in for a chilly old October day in wet gear. Anyway, I eventually got fishing, and whilst trying not to fill my waders (not just with water), I managed to winkle out three fish. Not great. Especially when said angler downstream was hauling them out. A hot sandwich and a cuppa at lunch certainly helped warm me up ahead of the afternoon session, and the sunshine even made a soul-boosting appearance. Off we went to fish again. Whilst I was keeping tally, the guy fishing ahead of me caught one fish for the session. My competitive streak was telling me I can surely do better, surely! Well, again, any form of rivercraft seemed to desert me, the pressure cooker of competitive angling getting the better of me! The now bright sunshine behind me was casting a long dark shadow across the water right where the fish were likely to be lying. I didn't even think about going over to the other bank until it was too late and I'd spooked every fish in the area. When the scores had all been toted up, I managed a paltry three fish for three hours fishing effort. To put this into context, there were plenty of guys catching 20+ fish per session. One chap managed 40-odd in a single session!! I was right to worry about humiliation! Generously, and wholly undeservedly, a pair of brand-new Costa sunglasses was the prize for the wooden spoon. But somehow, I even managed to avoid coming last. The only thing I took home that night was bruised morale, and a clean(ish!) pair of pants. On reflection, whilst my confidence with the techniques took a bit of a hammering, it was a fantastic day, brilliantly organised and hosted, great laughs and a few beers. Would I do any competition angling again? Maybe. If so, probably the Broadlands Classic again. Why not? It was enjoyable. So, in 2017, I re-entered the competition with my expectations more suitably aligned to my capabilities as a fisherman. In the end, I even surprised myself by coming third...third last!